As MousePlanet announced earlier this month, Disneyland Resort hiked ticket prices for 2019. Many believe it's a way to help control the potential crowds for the summer opening of Star Wars: Galaxy's Edge, the newest "land" in the resort. This means you might want to rethink your strategy to visit the resort at a different time in lieu of braving the Star Wars Land masses. Our own MousePlanet contributing writer Megan Walker shared with readers what she is looking most forward to this year. On her list are surprises and celebrations Disneyland Park has in store for some of its most iconic attractions. Instead of a blast to a galaxy far, far away, mark your calendar for some of these notable dates. "Jumpin' Jeepers!" – it's Roger Rabbit's Cartoon Spin's 25th anniversary! This spinning, dizzying dark ride debuted January 26, 1994, roughly one year after Mickey's Toontown opened it's gates in Disneyland Park. Based on the popularity of Who Framed Roger Rabbit?, guests board Lenny the Cab (Benny's cousin) and immerse themselves in the plotline of Roger and his wife Jessica escaping from the villainous weasels. Lenny's steering wheel allows maximum spinning for an interactive twist. The license plates hanging on the wall near the start of the queue, are coded to Disney characters and phrases. Look for BB WOLF (Big Bad Wolf), and ZPD2DA (Zip-a-dee-doo-da) just to name a few. No exact date has been set yet for the opening of Star Wars: Galaxy's Edge other than this summer, with speculation on June. Whatever the date is, June 14 is a MUST visit to celebrate not one, not two, but THREE of the park's most iconic attractions. On this date 60 years ago, Submarine Voyage (now Finding Nemo Submarine Voyage), Matterhorn Bobsleds, and the Disneyland Monorail all debuted to guests. Wow! That's a lot of nostalgia. This particular attraction was one of several that opened during an expansion of Fantasyland and Tomorrowland in 1959. Guests would climb aboard the submarines to embark on a journey under the sea to spy shipwrecks, mermaids, and even a sea serpent. The mermaids made it onshore during 1965-1967 as female cast members dressed in costume and could be seen sunning themselves on the rocks in the lagoon. Due to potential health issues from the submarines' exhaust and the chlorinated water, and the fact guests attempted to swim out to the girls, this feature ceased. The attraction permanently docked in 1998 and didn't reopen until 2007, this time as Finding Nemo Submarine Voyage as it currently sails. 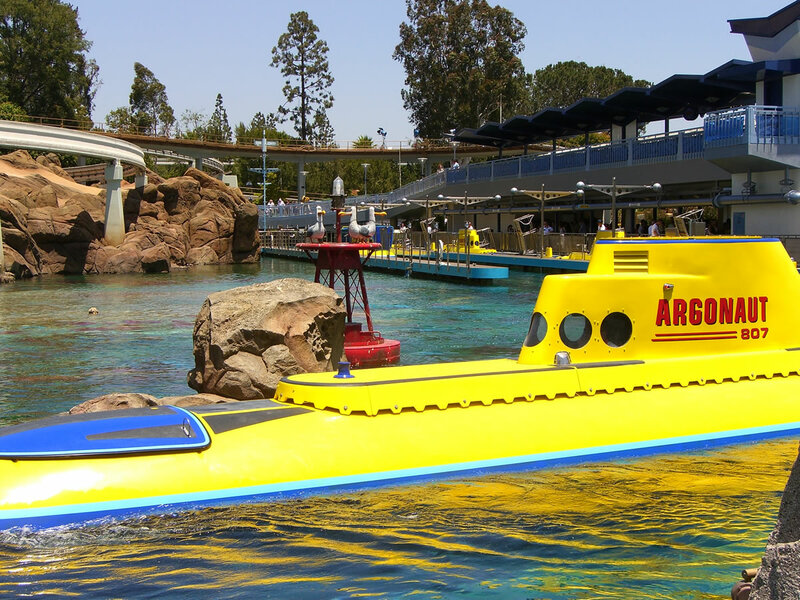 Once steel gray, the submarines now display a brighter look to match the current attraction Finding Nemo Submarine Voyage. Photo by Adrienne Vincent-Phoenix. Next time you're in line, look for a few of the etched Nemos on the rocks bordering the queue. The iconic sea serpent sold for just more than $90,000 at a private auction last summer. It was part of one of the largest private Disney collections owned by an individual. The famous Matterhorn Bobsleds attraction was inspired by Walt Disney's visit to Switzerland during filming of Third Man on the Mountain. The attraction opened as part of the aforementioned expansion of Fantasyland in 1959. Everyone's favorite Yeti, "Harold" as named by Disney Imagineers, was added in the late 1970s. Harold was revamped with newer animatronics and audio tracks in 2015. 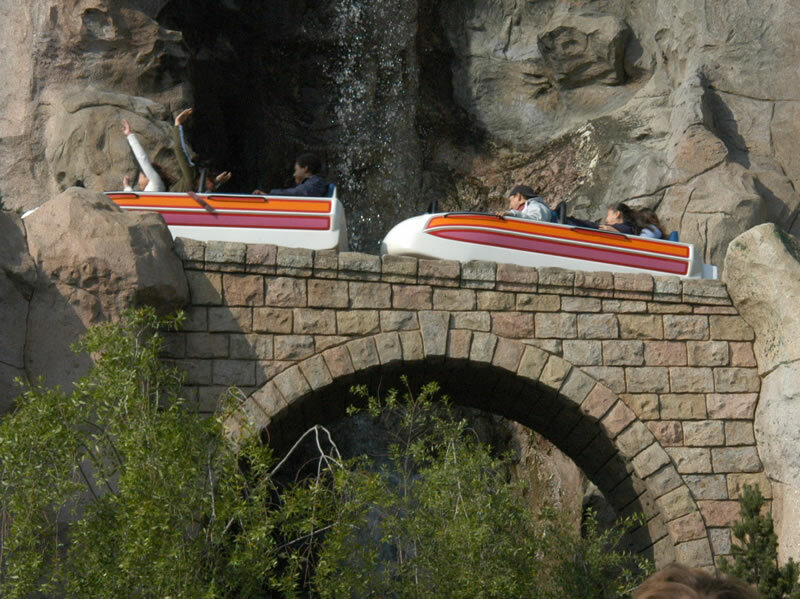 These older models of the Matterhorn Bobsleds sport a bright color scheme. Photo by Adrienne Vincent-Phoenix. There is a basketball half-court inside the top of the mountain although it has been relocated. According to current cast members and mountain climbers, it's still functional. A tribute to former Walt Disney Company President Frank Wells hides inside the mountain. Wells was an avid climber having almost completed the "seven summits" goal of climbing the highest peak on each continent. Guests can see the nod to Wells on a pile of equipment in the center of the mountain along the bobsled tracks. One of the older models of Harold is hidden in the boiler room portion of Guardians of the Galaxy: Mission BREAKOUT! located in Disney Califorrnia Adventure Park. Walt's monorail transportation (Disneyland ALWEG Monorail System as it debuted) was the first daily operating system in the western hemisphere and the first in the United States when it opened on June 14, 1959. It originally encircled Tomorrowland and in 1961 extended to a 2-1/2 mile loop to include the original Disneyland Hotel. Since then, the system has undergone several revamps, one which included the Downtown Disney Station. Walt Disney, Richard Nixon and family dedicate the debut of the Disneyland Monorail in 1959. Photo courtesy of MousePlanet. 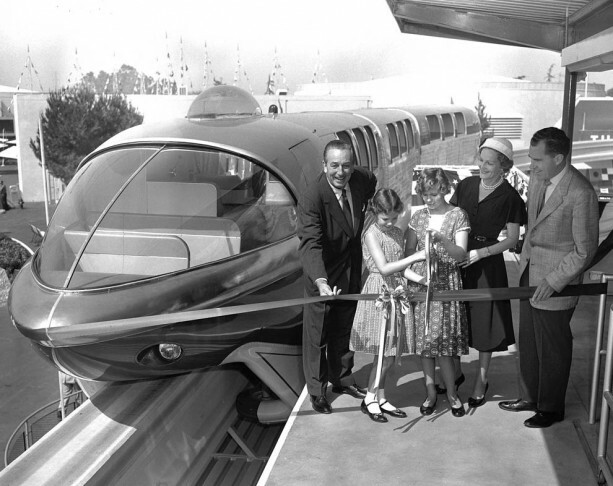 George McGinnis shared his story of designing Disneyland's Mark V monorail with MousePlanet. Disney's Grand Californian Hotel and Spa was originally slated to host a station. You can see where the initial location is when you visit the lobby. The large, wide staircase which leads up to the second level, was supposed to lead to the monorail station platform in early conceptual plans. Brer Bear, Brer Rabbit, and Brer Fox debuted on Disneyland's birthday, July 17, 1989 marking it's 30th birthday this year. The idea of a log flume was fused together to bring life to what was then a stagnant Bear Country, now Critter Country. Disney Imagineers combined the animatronics from America Sings! within the storyline. Guests can catch a majority of those older animatronics at the grand finale showboat scene. Splash Mountain's final drop which coasts into the briar patch is 50 feet high! Remember, you "might" get wet. July 17 is the Happiest Place on Earth's birthday! Join Mickey Mouse and his friends for a day of celebration. Even though this year marks the 64th anniversary of the park—not a milestone year— it's still a day cast members and guests hold sacred. It's a toss-up as to which is the most iconic attraction at Disneyland Park: Pirates of the Caribbean or The Haunted Mansion. Pirates of the Caribbean celebrated its golden anniversary just two years ago, and now, it's The Haunted Mansion's turn. On August 9, dress your dead best to celebrate the 50th anniversary of the 999 happy haunts who inhabit New Orleans Square's most macabre structure. The story behind the evolution and construction of The Haunted Mansion is a book unto itself but if you have an interest, the "Happiest Haunts" tour offered during September and October at Disneyland Park taps into some of that history. Guests look forward to the first weekend September when Jack Skellington and the rest of The Nightmare Before Christmas characters move into The Haunted Mansion Holiday. Photo by Lisa Stiglic. The ghost host is legendary voice artist Paul Frees, who also voiced the pirate captain in the Pirates of the Caribbean attraction. For Rankin and Bass fans, he's also the voice of the Burgermeister Meisterburger in Santa Claus is Coming to Town. The vehicles on the moving belt are referred to as "doom buggies". "This here's the wildest ride in the wilderness!" warns would-be riders of Disneyland's Big Thunder Mountain Railroad marking its 40th anniversary on September 2. As the anchor attraction in Frontierland, guests gladly wait in the queue to climb aboard to loop, turn, and circle out of control on this beloved icon. The design of the rock formations are based on the hoo-doos of Bryce Canyon in Utah. Guests swear by the "goat trick" in which riders will keep their eyes trained on the goat eating the TNT sticks. This causes riders to become dizzy and disoriented which heightens the fast-paced attraction. At this time, Disneyland Park has not announced as to what particular celebrations may accompany each attraction milestone anniversary. Based on past events, look for buttons, pins, and maybe even special merchandise—especially for the 50th anniversary of The Haunted Mansion. It's sure to be a monster celebration. Keep checking MousePlanet for current updates. Happy celebrating and congratulations Disneyland Park on these incredible milestones.